During the restoration period, naval ships were designed with an eye towards beauty as well as war. 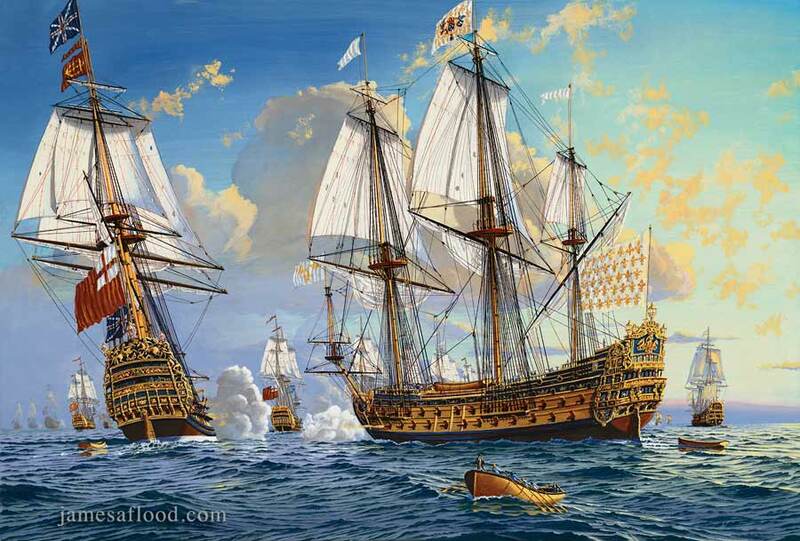 In this painting, His Britannic Majesty's Fleet of King Charles II is depicted after reconnaissance during the Third Anglo-Dutch War, the setting sun illuminating the full glory of this magnificent naval force as the ships execute a combining maneuver to bring them into a line ahead in order to ascend the Thames River. Here the 80-gun HMS Hampton Court follows the beautiful new 100-gun ship of the line, HMS Royal Charles, accompanied by other ships of the line and two royal yachts.